It was a cold and windy day with sun and cloud for our day of geoconservation work, under the watchful eyes of Laura and Anna from the Birmingham and Black Country Wildlife Trust. We met at 10.00 at the car park off Beacon Lane. 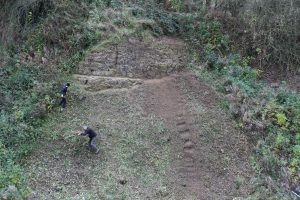 The day was spent clearing vegetation from the quarry at the northern end of Sedgley Beacon Hill, previously cleared in January. 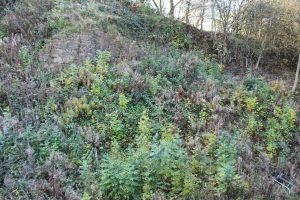 The quarry had become heavily overgrown since our last visit and our first job was to clear an access route to the only visible outcrop, perched towards the top of a steep slope. This done, we started to dig away soil from the base of the outcrop to create a bit of a platform to help make viewing easier. Laura and Anna kindly provided hot drinks and biscuits for lunch as well as tools for the clearance work. Today, Sedgley Beacon is much used by the locals for dog walking, mountain biking and running. Rising to approximately 237m (777 feet) above sea level the hill has been the site of a beacon for over 400 years with a tower in place since the 1700s. The current tower, some 50 feet high and 7 feet in diameter, was erected in 1846 by Lord Wrottesley, and is constructed of Gornal sandstone, known locally as the Gornal Grit. Several stories give a reason for the tower’s construction: to mark the highest cultivated ground in England; as an astronomical observatory; or as a folly. Today the tower is a Grade II listed building and an iconic symbol for Sedgley and Coseley. 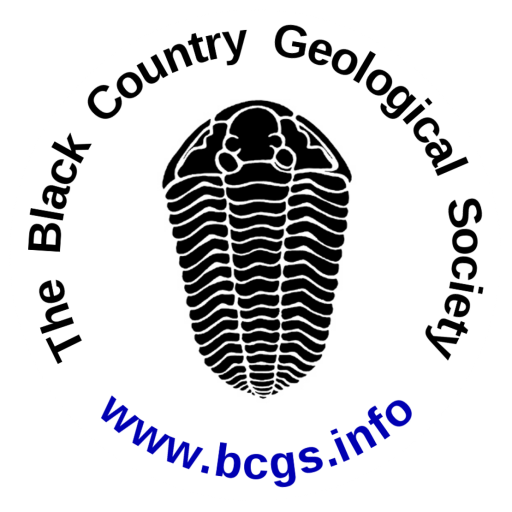 The Gornal Sandstone is generally described as a yellow-brown, fine-grained, micaceous, well-sorted, cross-bedded sandstone and dates to the Pridoli Epoch, which spans the end of the Silurian and the beginning of the Devonian periods. This sandstone belongs to the Downton Castle Sandstone Formation, which resulted from the fluvial deposition of sands and silts into coastal deltas during the onset of the Caledonian Orogeny, around 380Ma. It was deposited under shallow, warm, marine conditions, and forms quite a contrast to the earlier Silurian Aymestry Limestone (part of the Ludlow Series) which forms Sedgley Beacon Hill. The stone for Sedgley Beacon Tower very likely came from the quarries of Upper Gornal and Ruiton where, up until the mid 1900s, it was extensively quarried as a building material for local churches, houses and windmills. Good exposures of these rocks can be found off Holloway Street in Lower Gornal. However, some of the exposures do require permission to visit.